(CNN) - Books, filled with prayers for peace, splattered with blood. Sacred vestments shredded by bullets and knives. Lifeless bodies in the sanctuary. The rabbis had gathered to ask God to bestow blessings upon their troubled land. Their prayers were interrupted by two men wielding butcher knives and a gun. An Israeli police officer and four rabbis were killed, including an American whose family is considered "rabbinic royalty." Combined with the site of the slaughter - a synagogue in West Jerusalem - the targeting of rabbis struck at the soul of Jews around the world, several Jewish leaders said Tuesday. (CNN) - This week, Barak Barfi, the spokesman for slain American journalist Steven Sotloff’s family, joined many Muslims in exposing the hypocrisy and hollowness of groups like ISIS. He challenged ISIS leader Abu Bakr al-Baghdadi to a debate that pits Islam’s theology of life against ISIS’ cult of death. In doing so, Barfi cited verses in the Quran that shun murder even a 6-year-old could understand: "Fight in the cause of God those who fight you and do not transgress, God loves not the aggressors" (2:190). This verse is about self-defense. It allows one to protect civilians by fighting combatants who attack first. It forbids aggression, which is a grave sin in Islam. By citing this verse, Barfi challenged all extremists to a debate that would expose their bankrupt cult of death for the forgery it is. Barfi also talked about mercy in Islam. Mercy is an essential attribute for Muslims. God delivered Prophet Mohammed to humanity to make us more merciful to one another. (CNN) - The challenge was directed at the leader of ISIS, Abu Bakr al-Baghdadi. But the impassioned message, laced with Islamic phrases, sought a much wider audience. The statement came from Barak Barfi, a spokesman for the family of slain American journalist Steve Sotloff. Sotloff, who reported for Time and other publications, was beheaded in a video ISIS released on Tuesday. Barfi is a research fellow at the New America Foundation, a Washington-based think tank, where he specializes in Arab and Islamic affairs. On behalf of Steven Sotloff's family, he had tried to secure the journalist's release. On Wednesday, Barfi stood outside the Sotloff family's Miami home, with dozens of microphones and cameras thrust before him, and stepped into a fierce war of words between ISIS and the rest of the Muslim world. Speaking briefly to CNN on Thursday, Barfi said he doesn't expect the reclusive ISIS leader to accept the invitation. But his challenge had other aims, the young scholar said. (CNN) – We don’t know if James Foley, the American journalist beheaded by Islamic extremists, prayed in the hours and days before his death. We probably never will. But Foley said faith sustained him during another ordeal in 2011, when he was held captive for 44 days by forces loyal to Moammar Gadhafi in Libya. In a gut-wrenching article he wrote for Marquette University’s alumni magazine, Foley said he prayed while imprisoned that his family, many miles away, would somehow know that he was safe. “Haven’t you felt my prayers?” Foley asked his mother, Diane, when he was finally allowed to call home. Diane Foley told her son that his friends and family had been praying, too, holding vigils filled with former professors, priests and Marquette students. She echoed his question back: Have you felt ours? He had, the journalist said. “Maybe it was others’ prayers strengthening me, keeping me afloat,” Foley wrote. The 40-year-old Catholic, who reported for the GlobalPost among other publications, was abducted again in 2012, captured this time by the extremist group ISIS, which calls itself the Islamic State. On Tuesday, ISIS released a video showing a Muslim militant clad in black beheading Foley, who was wearing an orange jumpsuit and kneeling in the sand. The Pope says ISIS must be stopped. But how? (CNN) - Nearly everyone agrees that the militant Muslim group rampaging through northern Iraq must be stopped. The question is, how? Asked if he approved of the American airstrikes against ISIS, Pope Francis withheld his moral imprimatur on Monday, refusing to fully support or denounce the military campaign. "I can only say this: It is licit to stop the unjust aggressor," the pontiff said during a press conference on the plane back to Rome from South Korea. "I underline the verb: stop. I do not say bomb, make war, I say stop by some means." In an apparent reference to the United States, Francis said "one nation alone cannot judge" the best means of stopping groups like ISIS, which calls itself the Islamic State. Those decisions should be made collectively by the United Nations, the pontiff said. "It is there that this should be discussed. Is there an unjust aggressor? It would seem there is. How do we stop him?" the Pope asked, without answering his own question. Already, Francis' cautious comments about American airstrikes and the use of force have fostered a welter of interpretations, from "tacit approval" to a "yellow light" to outright endorsement. The Pope who was returning to Rome after a five day trip to South Korea, may soon have the chance to clarify his moral argument personally to U.S. and UN officials. Who are the Yazidis, and why does ISIS want to kill them? (CNN) - In a church in Irbil, 40-day-old Yeshua lies asleep in a crib, his sister playfully rocking him. It's a peaceful scene. Their mother watches over them, but her face shows the fear and despair many Iraqi minorities have felt over the past few days. The Sunni militant group ISIS, which calls itself the Islamic State, has steamrolled into Iraq's north, forcing hundreds of thousands of minorities from their homes. The militants have beheaded some who won't bend to their will and are "putting people's heads on spikes" to terrorize others, a senior U.S. administration official said. Nearly 40,000 Yazidis are trapped on the top of Mount Sinjar with few resources; many with just the clothes on their back, U.S. President Barack Obama said in an address late Thursday evening. "These innocent families are faced with a horrible choice," Obama said. "Descend the mountain and be slaughtered, or stay and slowly die of thirst and hunger." So who are these people being threatened by the Islamic State? And why do the militant Islamists have them in their cross hairs? (CNN) - Last week a video of Hamas spokesman Osama Hamdan emerged in which he claimed that Jews use the blood of non-Jewish children to make matzo for Passover. We all remember how the Jews used to slaughter Christians, in order to mix their blood in their holy matzos. This is not a figment of imagination or something taken from a film. It is a fact, acknowledged by their own books and by historical evidence. It happened everywhere, here and there. Whatever “historical evidence” or “facts” Hamdan believes himself to be remembering, this is nothing more than the infamous blood libel: the most persistent and longest-lived anti-Semitic myth in history, aside from the claim that the Jews killed Jesus. The blood libel originated in medieval England with the death of William of Norwich. William was a 12-year-old tanner’s apprentice who was killed in 1144. At the time of his death, his parents accused the local Jewish community of responsibility, but investigations revealed nothing. (CNN) –We had no idea what we were doing, so we helped everyone. Since the fall of Mosul to Sunni militants in June, the world has struggled to accept the failure of the American project in Iraq, the rise of “political Islam” and the marking of Iraqi Christians and other minorities for death or expropriation. The world may watch from afar and denounce all Iraqi Muslims as militants bent on conquest. But up close, the reality is very different. It was a Muslim cleric who may have saved this Christian's life. And I'm not the only one. Even as jihadists justify their atrocities in the name of Islam, millions of Muslims are standing in solidarity with Christians who have been expelled from their homes. What's religion's role in the Mideast crisis? CNN's Poppy Harlow interviews religious leaders from Christianity, Islam and Judaism about the role of religion in the Mideast conflict. 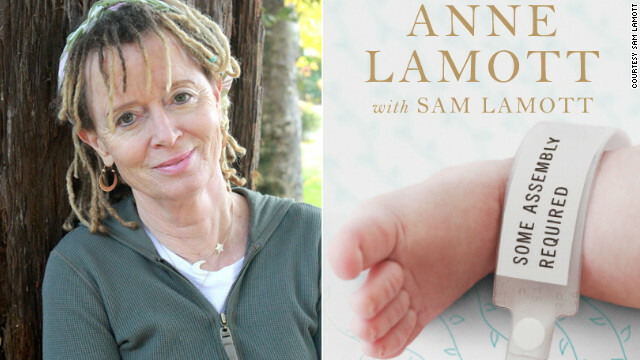 Anne Lamott is the author of several books, including "Some Assembly Required," written with her son, Sam. (CNN) - Author Anne Lamott says she begins her day by checking the news as soon as she wakes up. “If the world is coming to an end that day I am going to eat the frosting off an entire carrot cake: just for a start," she wrote in a recent essay on her Facebook page. Lamott, the best-selling author of several books about spirituality, describes her specialty as topics that "begin with capital letters: Alcoholism, Motherhood, Jesus.” But in recent days, global events have been foremost on her mind. “The last two weeks have been about as grim and hopeless as any of us can remember,” she wrote, listing events like the Malaysia Airlines Flight 17 disaster in Ukraine, Palestinian children killed by rocket fire while playing football on the beach and protests against young refugees showing up at the U.S. border. Lamott posted her response to those events on her Facebook page on Sunday; the essay quickly received more than 18,000 shares and thousands of comments. “I used to think that if the world — or I — were coming to an end, I’d start smoking again,” she wrote. But that's going too far, Lamott said, settling for the simpler pleasure of sweet pastries. Despite tragedies both deeply personal and worldly, Lamott said she turns to a hard-won, if somewhat restless faith.